I Will be rolling out different colours in these but trying to stick to 3 on the button. . If you have a large order ask for a price and I will look at custom colours. 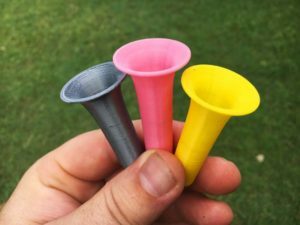 The three colours that are available now are Pink, grey and yellow. shown in the picture below. Read more about these here. Please note: Shipping and handling fee of $9 applies. Refined wax! This is the purified wax you get after you take most of resins out of the hive structure. 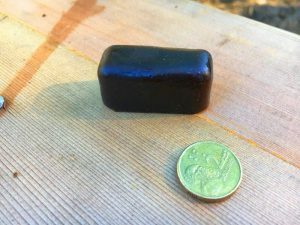 This 15 gram block would take the bees many, many years to produce. Ideal for placing around the hive entrance to support new colonies or seal new hives internally. $10.80 Postage and handling fee applies. This is a poster that I put many hours into painting. 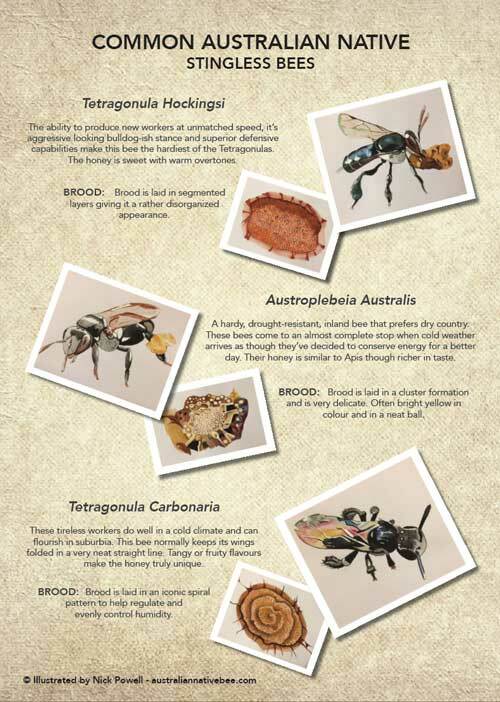 It is a reprint of three of our most commonly kept stingless bees. Tetragonula hockingsi, Austroplebeia australis and Tetragonula carbonaria . The medium used was water colour. The poster is A3 in size. Postage of $9.95 will see your posted arrive safely anywhere in Australia inside a postal tube. 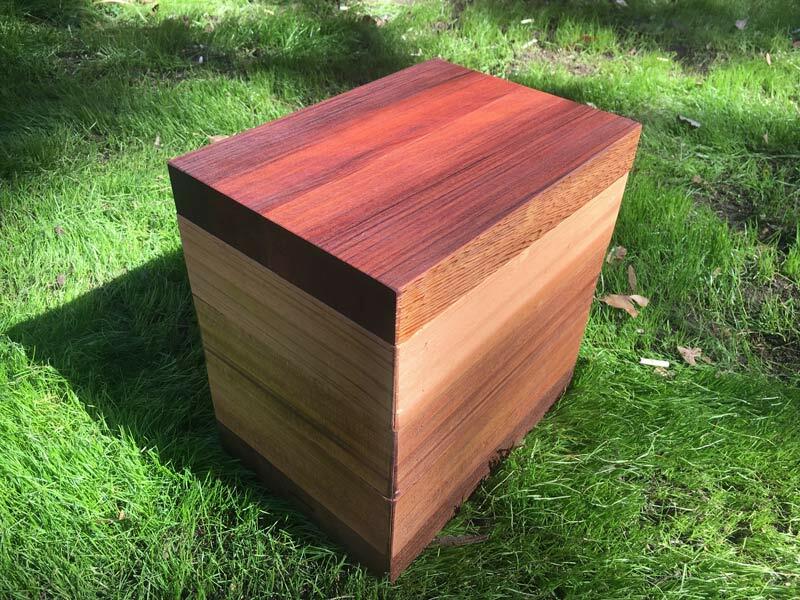 I am pleased to be helping Noel sell his beautiful quality hand made hives. I believe his design and care taken in producing a quality hive is something to be looked at. Thick hive walls and quality in fit and finish will see your bees happy. I have available several well established hives with a strong colony of either Tetragonula carbonaria or Tetragonula hockingsi with a good quantity of brood and bees. The square design of my hives is inspired by the Aussie INPA hive and includes several features of that design. 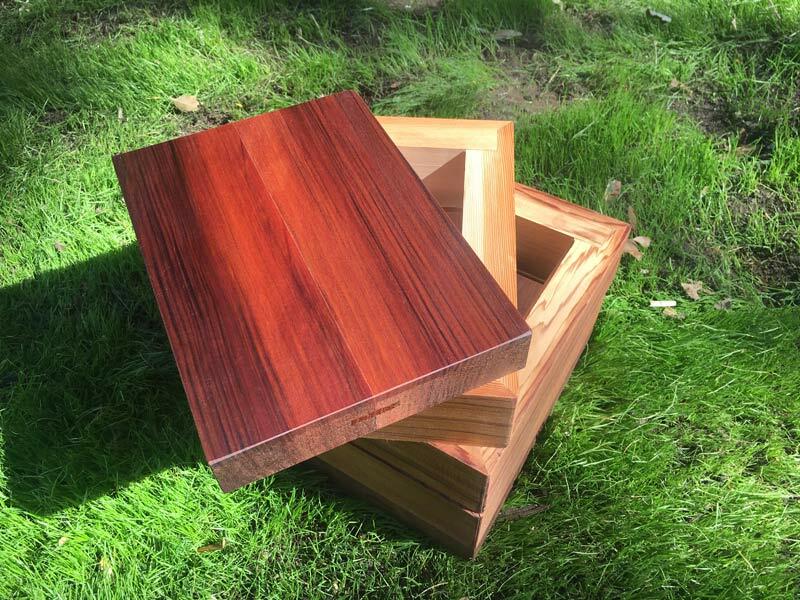 The three levels , separate base and lid are made from 42 ml thick untreated hoop pine. The use of timber of this thickness is to sufficiently insulate the hive to protect the colony against the elements, especially heat. 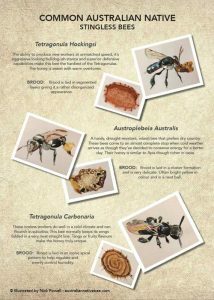 Some hives on the market made from very thin material may not provide this protection during extremely hot or cold conditions. The lid top and sides and the tropical roof are constructed from marine grade ply and western red cedar. Both the lid with its deep sides and the tropical roof are designed to provide further protection of the colony against the weather. Each level has two stainless steel separator plates for easy future hive divisions. 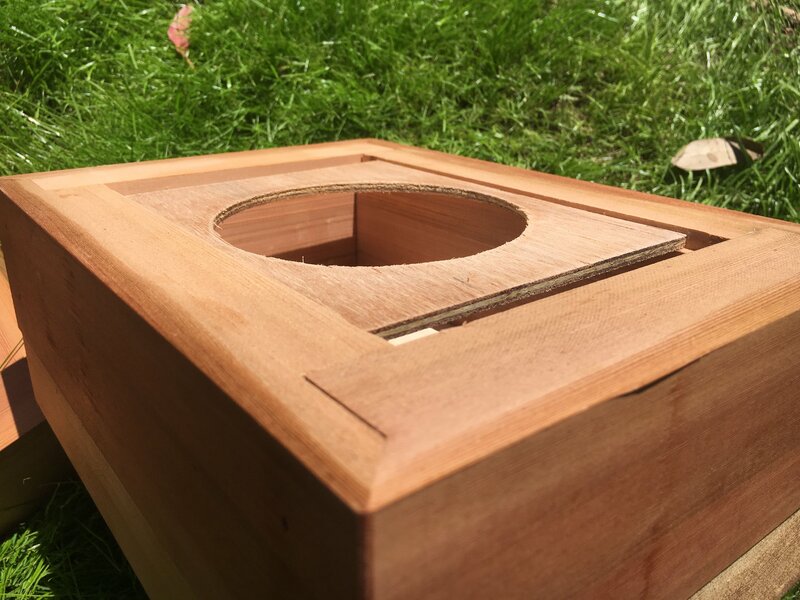 The top level is fitted with a clear inspection panel for viewing the internal workings of the hive. All exposed areas are finished with four coats of quality exterior paint. Delivery [within reason} and installation of the hive by one of the following is included.
. Star picket with mounting plate.
. 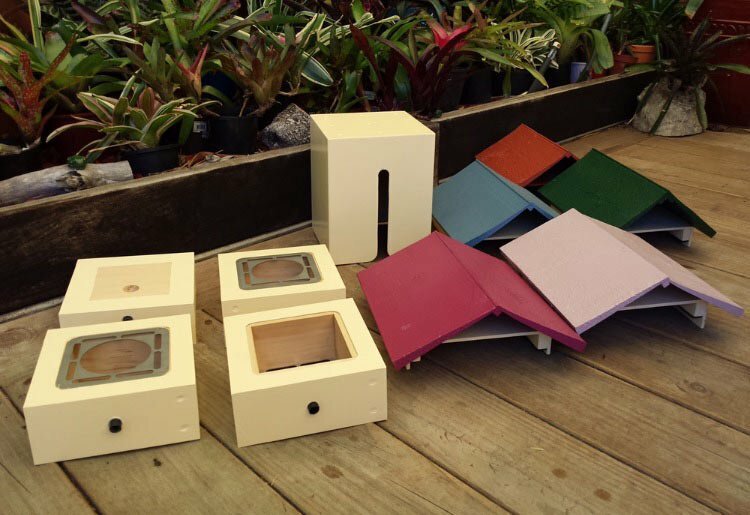 Shelf which may be fixed to a timber fence for example.
. Small table ideal for patios/outdoor areas etc.
. your choice of any of the tropical roof colours shown in the photos. The hives depicted in the photos are not necessarily those for sale and have been used to illustrate the different methods of installation. 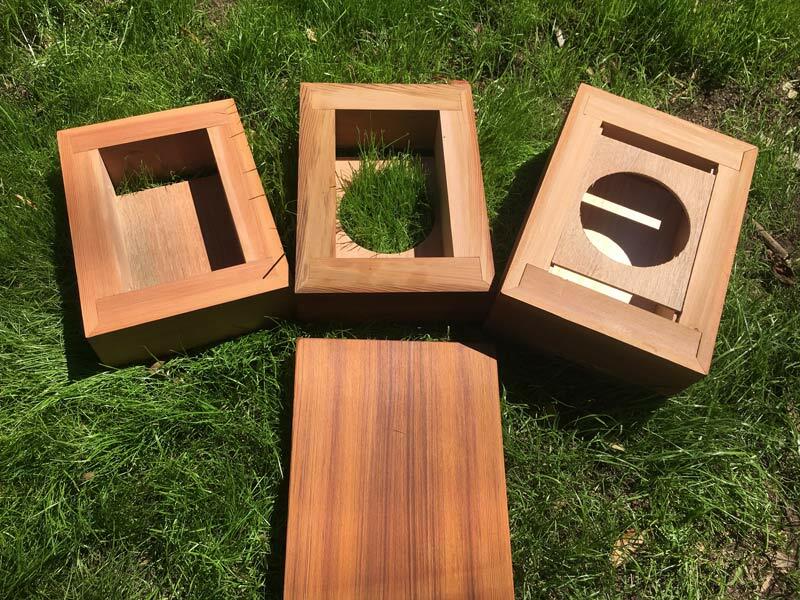 The individual empty hive shown in several of the photos is identical to those that are for sale that have the bees and brood included. These hives are pick up or delivery (within reason) from Redcliffe , north of Brisbane. 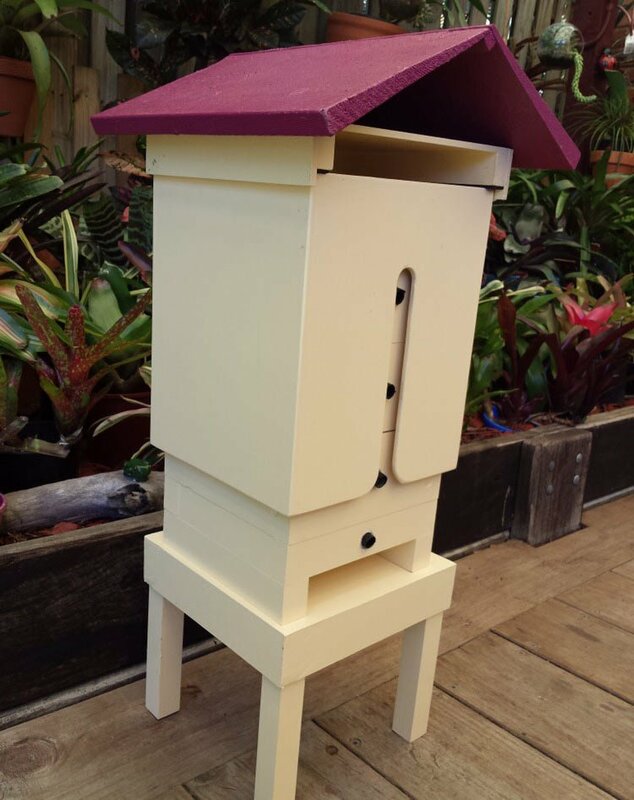 A sturdy quality hive built with hosting your special bees in mind. This hive box is ideal for placement where it will be seen and where you can also check on your bees. 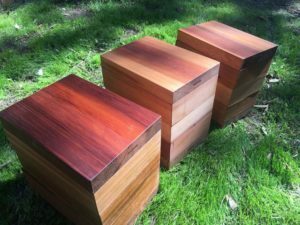 Made from beautiful western red cedar, its insular properties will keep your bees happy in summer and winter and will not suffer from sweating or condensation inside the hive. This timber is also naturally termite resistant, rot resistant, dimentionally stable and weatherproof. It has been used for centuries as a boat-building timber because of its durability and ability to work under a range of conditions. Suitable for Queensland and NSW. 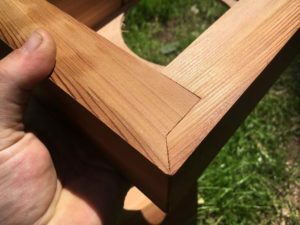 The hive features dropped wall heights with ply wood separators to give you an accurate mess free propagation when performing a split every time. 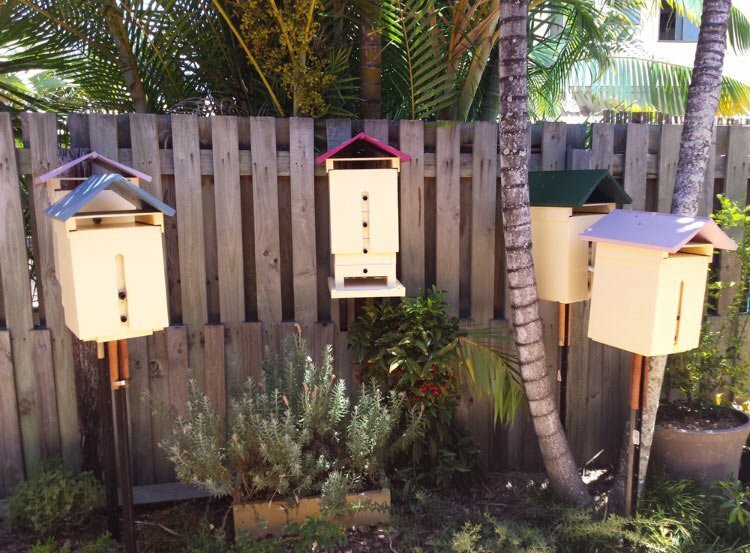 Hive with two brood frames, honey super and lid $195 plus $50 postage anywhere in Australia. Please contact me via email about availability if you’re interested in buying one of these unique hives. 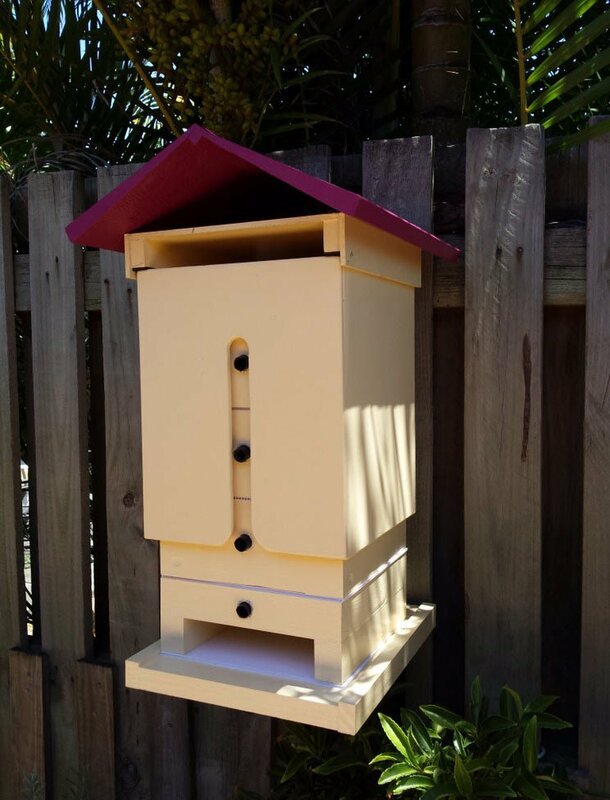 I recommend keeping this hive off the ground and away from water to prevent swelling if you choose to keep it clear coat, if you choose to paint this hive white it will withstand heats of 38 degrees outside in full sun. I have tested this myself with bees inside it. 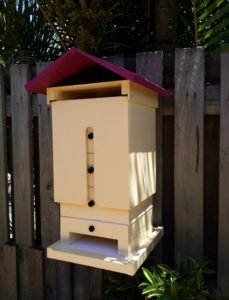 This hive is really a show piece and placing it under an eve of the house or on your veranda away from rain will keep the miters tight and your box looking beautiful. Click here to watch the video on this hive. These fit inside a box of 110mm/190mm and 94-100mm deep. Each half takes around 11 hours to make. Once your used to using these you can create a new colony in 1 minute, once your first frame is full. Minimal damage is caused to the colony allowing a fast bounce back post split. These frames can be used with all Austroplebeia; Symei, Cockerelli, essingtoni, ornata, websteri, percincta, cincta and of course australis if you prefer to call them all that. I believe these will also work very well with Tetragonula Sapiens and clypearis as I have had time to observe both these species in boxes and in their wild environments. Currently looking at new ways to produce these as they are very time consuming to produce.